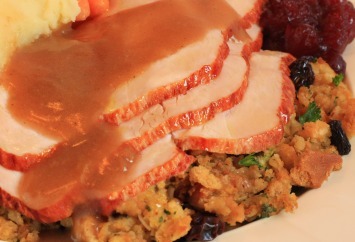 Turkey stuffing is the best part of the holiday meal as far as I am concerned. This sausage dressing recipe is absolutely fabulous and I know you and your family will love it. It has a mix of three different kinds of bread. Corn bread adds a bit of sweetness. You can use homemade or store bought. French bread has that nice thick crust and plain old sandwich bread for that softness. In a large skillet melt 2 tablespoons of butter over medium heat. Add the onion and cook, stirring, for 4 to 5 minutes or until softened. Transfer to a large mixing bowl. In the same skillet add 2 tablespoons of butter. When melted, add the apple and cook, stirring, for 5 to 6 minutes or until light golden. Transfer to the mixing bowl with the onion. In same skillet, add the remaining butter. Add the celery and cook, stirring, for 5 to 6 minutes or until softened. Transfer the celery to the mixing bowl. In same skillet, add the sausage. Cook, stirring to break up the sausage, for 7 to 8 minutes or until lightly brown. Transfer to paper towels to drain. Then add to the mixing bowl with the other ingredients. Stir to combine it all together. Add the corn bread, French bread, sandwich bread, thyme, parsley and eggs to the bowl and stir just to combine. Season with salt and pepper. Pour in enough broth to moisten the dressing but not enough to make it runny. Spoon the dressing into a 13"x9" (33 x 23 cm) baking dish. Bake in preheated 350ºF (180 C) oven for 45 minutes or until firm to the touch. If you prefer to put the stuffing inside the turkey, this also makes enough dressing to stuff a large bird. If you wish, you can add 1 to 2 cups of frozen or dried blueberries or cranberries for added nutrition, color and taste. You won’t believe the fantastic flavor it adds. I am not sure why this recipe states that you should cook the onion, apple and celery separately. I would cook it at the same time IF you have a large enough pan. I love turkey stuffing recipes of all types – traditional turkey dressing recipes with sage and savory as well as those that add fruit or sausage for a different flavor. Always dry all the breads for at least 12 hours before using them in the dressing. If you don’t it just gets too pasty in texture. The addition of chopped apple adds another note of sweetness, while the butter and onion add richness and a tang. You can also add dried or frozen fruit. The absolute best turkey stuffing I ever ate had blueberries in it. I was astounded because I had never heard of it, but it was fantastic. Dried cranberries or apricots work equally well. You can also try a mix. Dried blueberries and cranberries together would be quite good. You will find another tasty turkey stuffing recipe here.